PHOENIX - June 28, 2018 - PRLog -- monOrchid is pleased to announce the 2018 summer art show, "The Coterie Exhibition", displaying works of it's represented artists Sky Black, Antoinette Cauley, KC Haxton, Judith Ann Miller, Matt Priebe, John Tuomisto-Bell and Michael Viglietta. This show encompasses selected bodies of work, allowing each artist to tell their unique narrative within one space, thus creating a diverse show with a variety of styles including sculpture, contemporary abstract and portraiture. The show will run through the summer and can be enjoyed during upcoming Third and First Friday's as well as regular gallery hours. To learn more about each artist, please visit our 'Represented Artists' page. 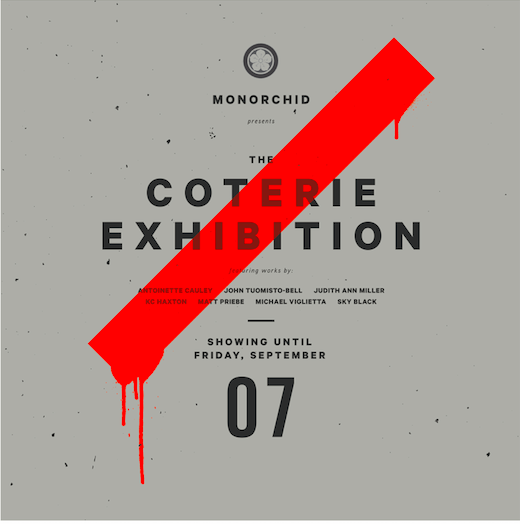 The Coterie Exhibition will show from June 23, 2018 - September 7, 2018.
monOrchid has worked diligently to create a space for all ages, backgrounds and walks of life to visit in hopes to promote a safe place of creativity and community. We invite you to explore our diverse venue and hope to see you soon!